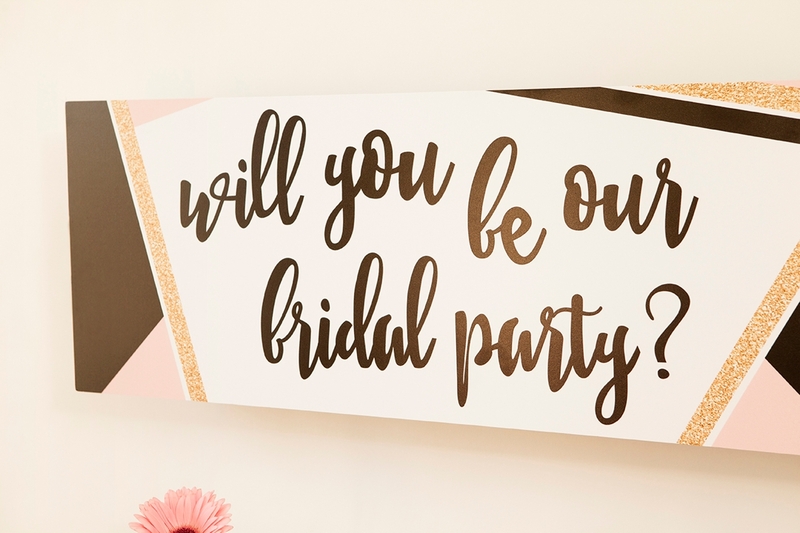 You HAVE To See This "Will You Be Our Bridal Party?" Party! 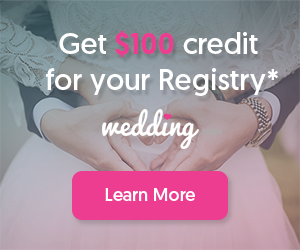 With “engagement season” right around the corner, I’ve been dreaming of new and unique ways for the newly-engaged to “ask” their besties to be a part of their special day. Sometimes narrowing down the perfect guys and gals to stand by your side is easy, and sometimes it takes a little more effort. Which is why I’d like to help out with the actual asking part, and I’m excited to share that Shutterfly is here to help too! 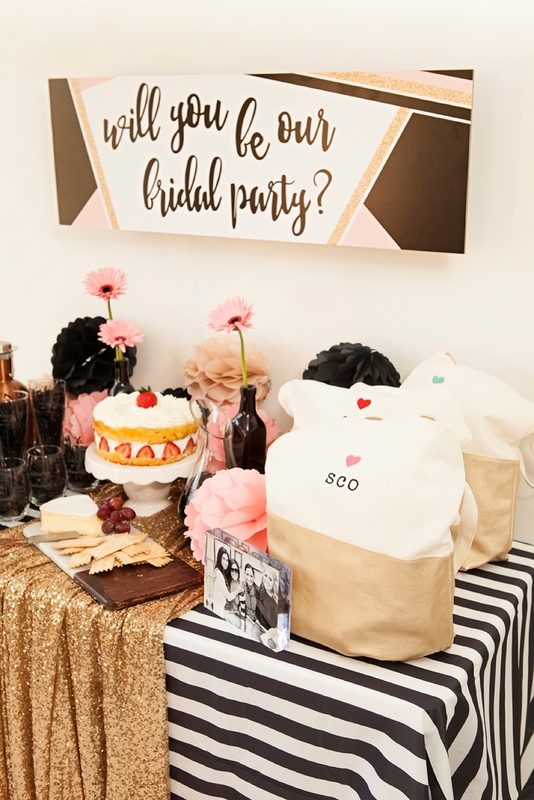 Today I’m sharing a super sweet idea for throwing your own “will you be our bridal party?” party, to bring both sides together to celebrate the occasion! Fun right?! And the perfect way to introduce everyone. 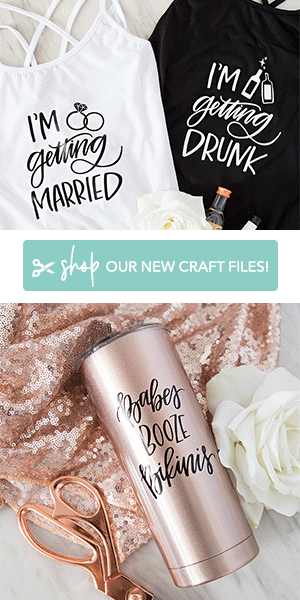 Over the past few weeks, Shutterfly has released the most darling personalized statement gifts and I know you’re going to fall in love with them like I did. 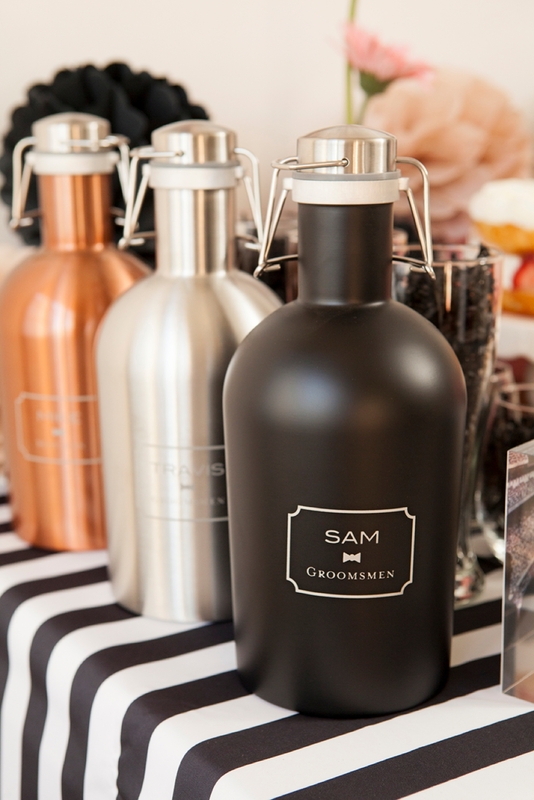 From custom engraved growlers to gorgeously embroidered canvas tote bags, they have your bridal party gift-giving covered. But of course, you should feel free to treat yourself with a custom gift (or two) for you and your fiancé as well! 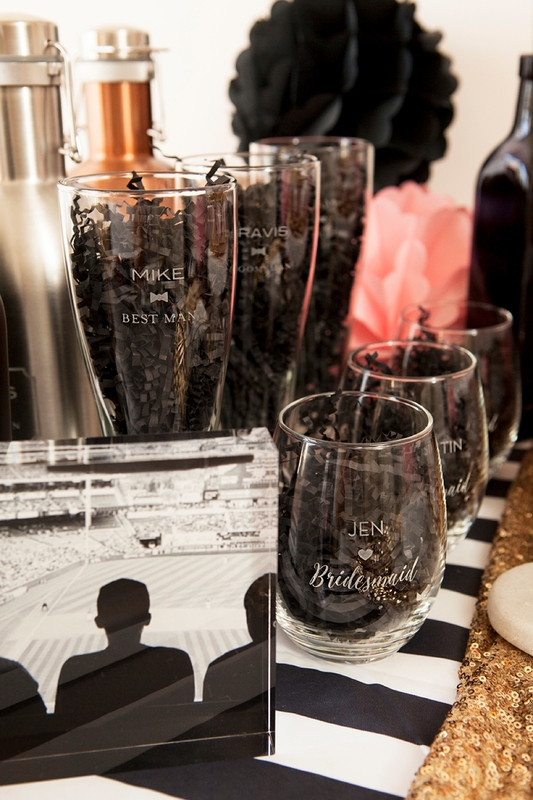 Have your entire bridal party toast to your engagement in style with these personalized stemless wine glasses and pilsner glasses. 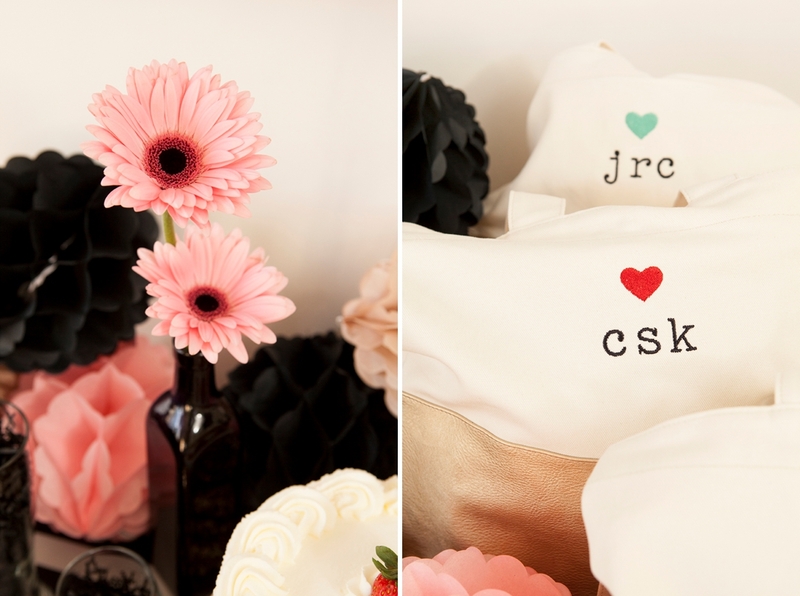 Add each bridal party members name and their role in your wedding. 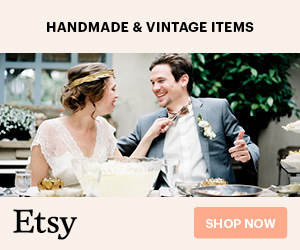 You can either gift these glasses to the guys and gals to use and enjoy throughout your engagement, or let them use the glasses at your party and keep them to use again at your wedding! 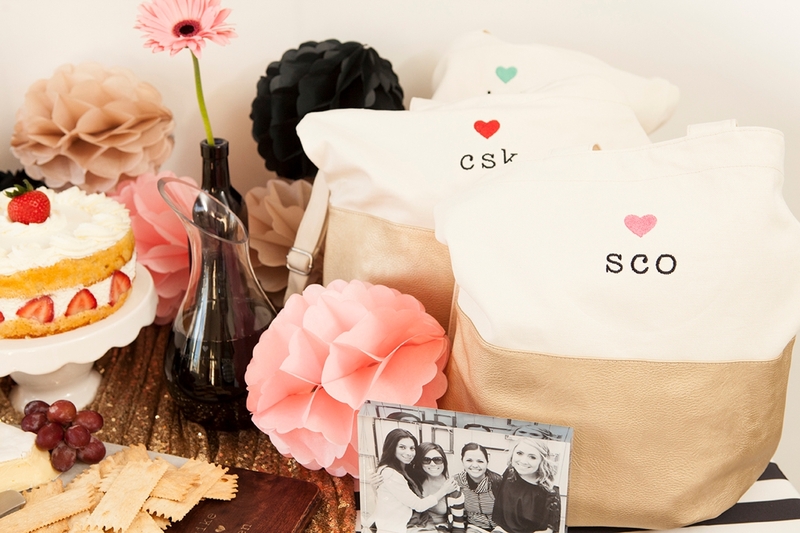 Most favorite item on the table: personalized bucket tote bags! Simply put, these tote bags are stunning and you all need one! The quality is superb, the gold accent is gorgeous, the inside is everything you’d want from a bag, and the fact that you can personalize the embroidery (including the thread color) is fabulous! 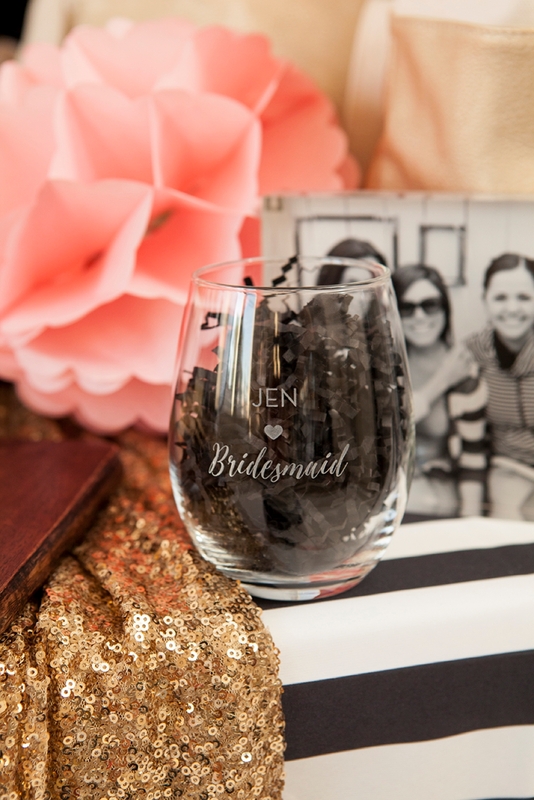 These are a bridal party gift must. 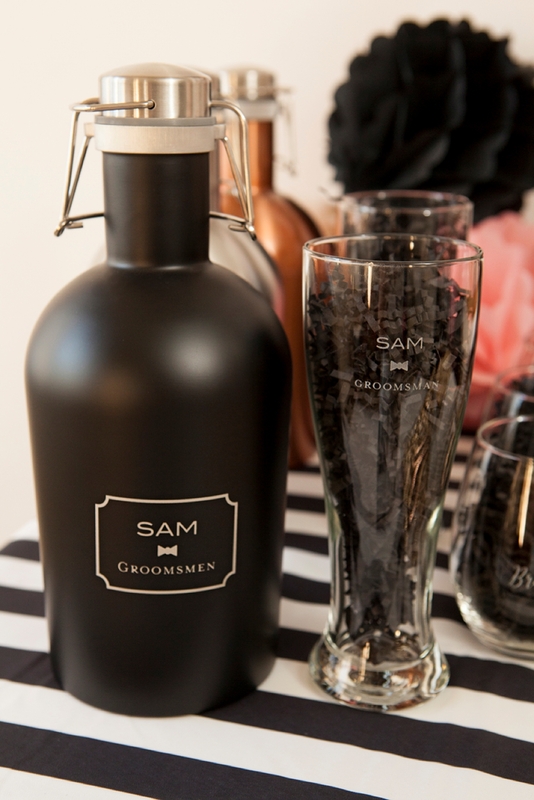 To keep the gift giving fair, treat the guys to these awesome personalized growlers! They come in three different colors, black, stainless and copper. These are the ideal gift for the craft beer enthusiast… and don’t forget to get one for the soon-to-be hubby too! Remember when I mentioned treating yourself to a custom gift for you and your fiancé? 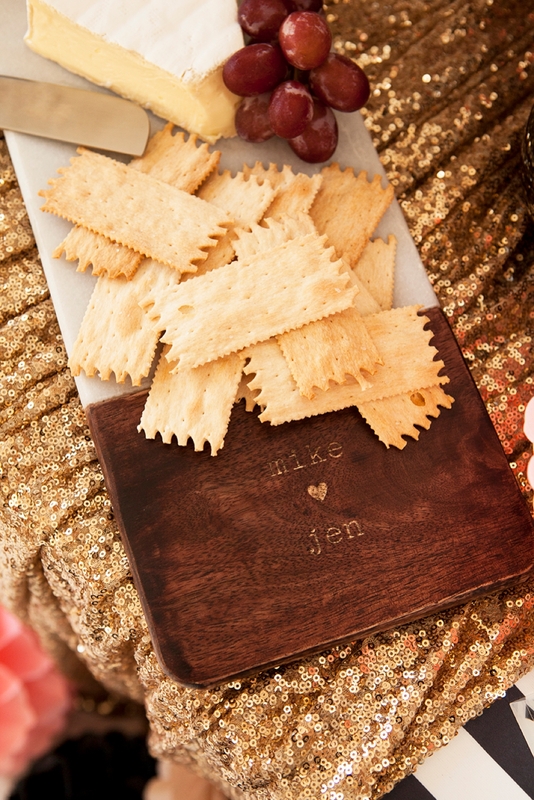 I’m obsessing over this personalized marble + wood cutting board… which makes for a lovely serving platter for your favorite cheese! The perfect gift for yourself or anyone that you’d like to give a personalized gift to! Love! 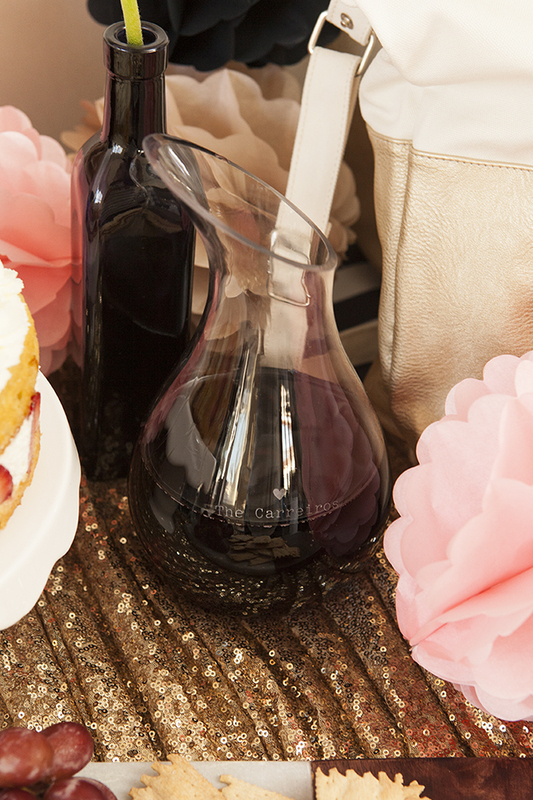 Make a personal statement with this one of a kind, hand-blown glass wine decanter that can be personalized over 10 different ways! 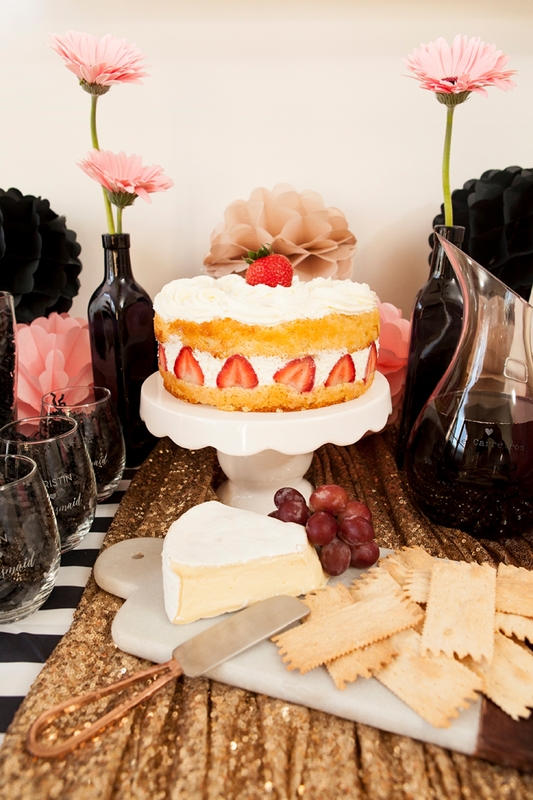 Another fabulous way to celebrate your engagement or your love of wine. 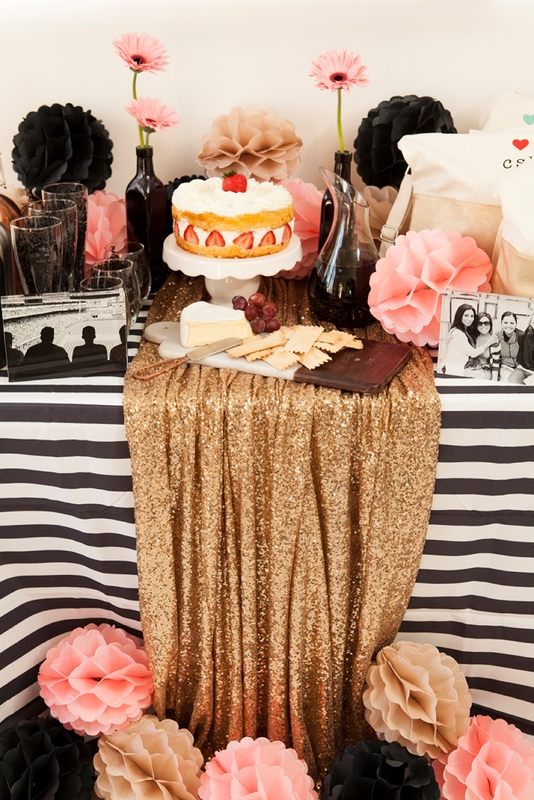 Throwing a personal, unique party is all about paying attention to the little details like this. 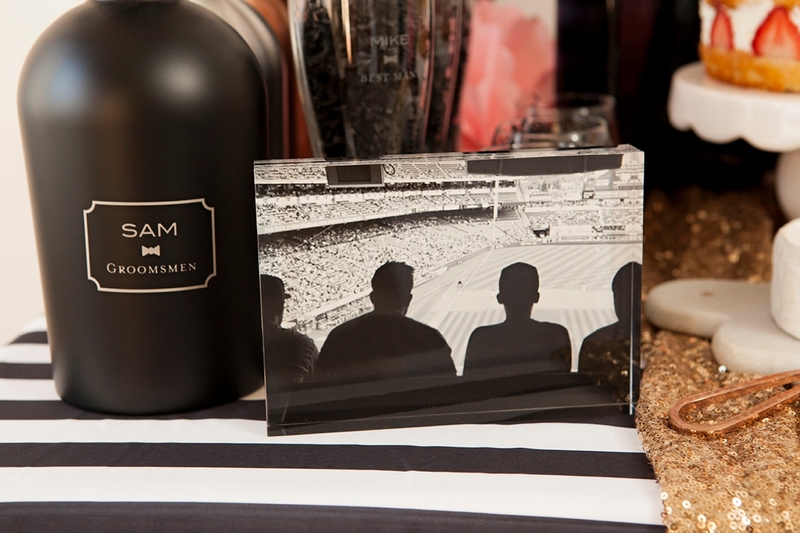 Order your favorite photos of you with your entire bridal party to display on the table! Since Shutterfly is known for amazing custom photo prints, choose from an array of different sizes, frames, plaques and more… like these awesome acrylic photo blocks! 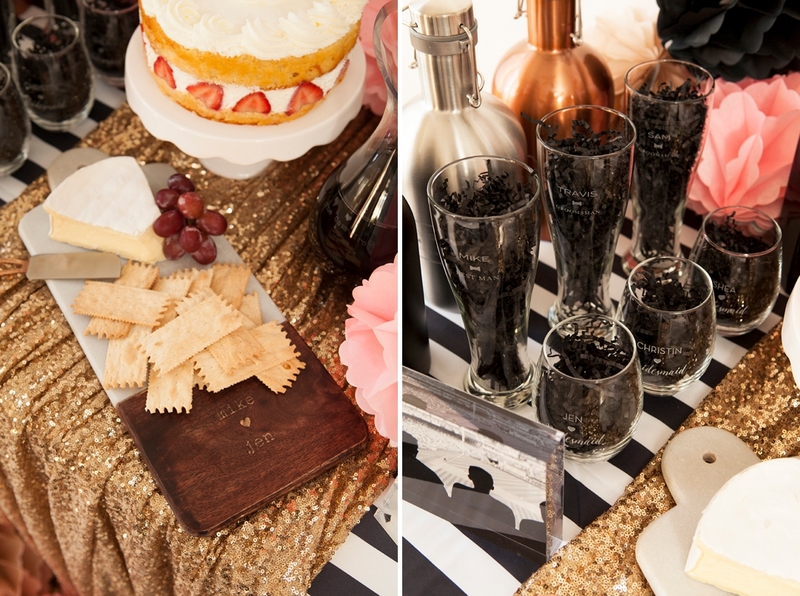 I turned the images black and white for cohesiveness with the table decor. 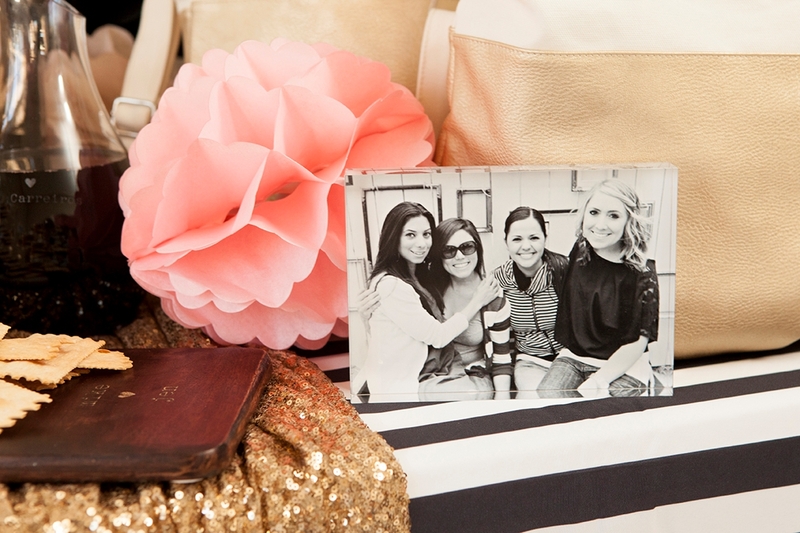 If you don’t have one picture with everyone, you can totally display them separately and it will look just as cute! In love with this sign I designed? Well guess what!?! You can download the jpg. of it below and order your very own from Shutterfly! 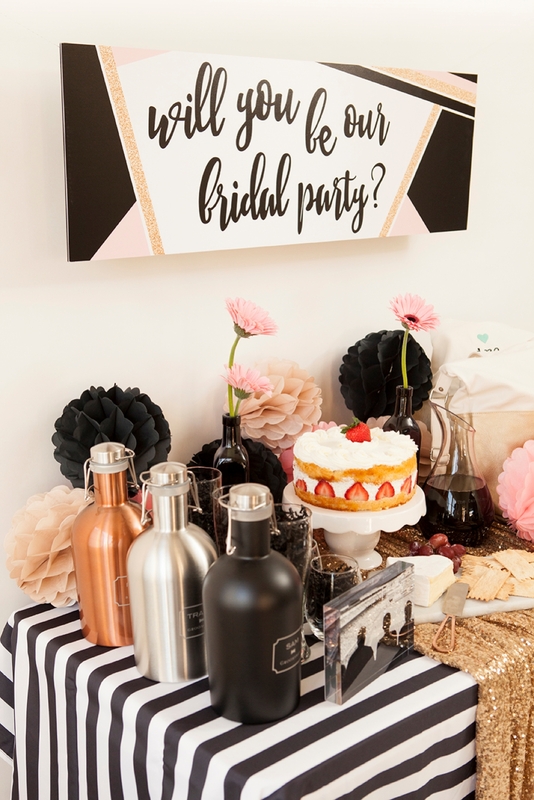 This uniquely sized mounted wall art is the perfect way to “ask” your friends to be in your wedding! —-> Order your own 12″ x 36″ sign here. 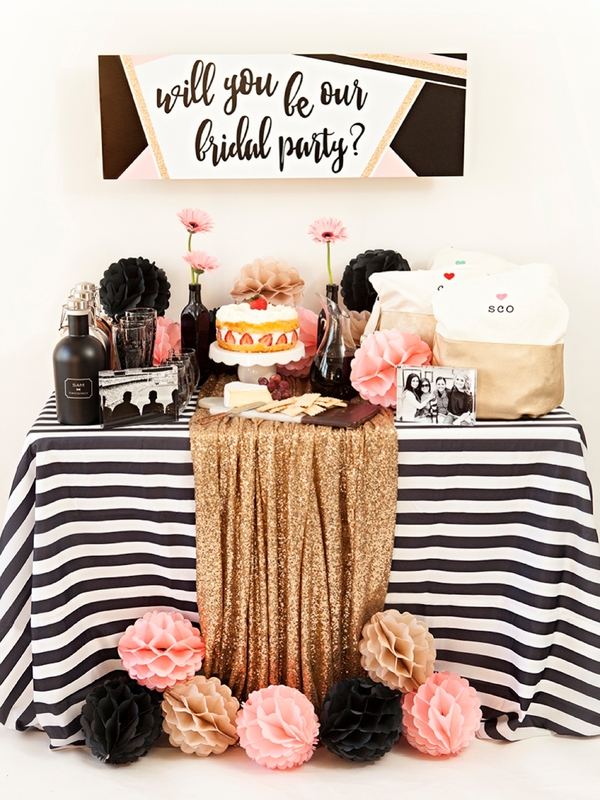 I hope that this soirée idea has inspired you in some way, either to throw your own co-ed bridal party, party or to learn that you no longer need a photo to make custom gifts unique. Just remember, personalized gifts (and parties) are always more meaningful! 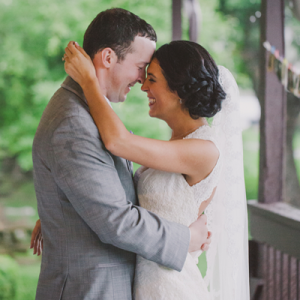 This post was sponsored by Shutterfly in partnership with BrideClick. 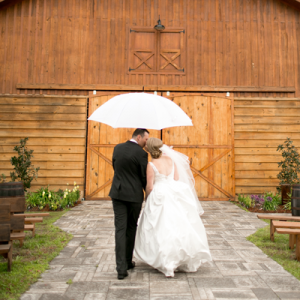 Shop Shutterfly for personalized wedding gifts that are unique, meaningful and just the way you want. All images copyright of SomethingTurquoise.com®.